job as a civil servant lecturer at the Department of Mathematics of the Faculty of Mathematics and Natural Sciences, Universitas Negeri Semarang. He also has experience as an academic staff member at the Centre of Development of Education Media (PPMP), Universitas Negeri Semarang, and as a reviewer of Interactive Educational Multimedia Production at the Department of ICT Development for Education (BPTIKP), Central Java, Indonesia. He teaches mathe- matics education, especially teaching and learning geometry and the use of ICT in mathematics education, and he has conducted several research projects in these areas. He has presented and published several papers in his research area in national and international forums and scientific journals. In 2006, he was recognized as the winner of a competition of teachers with smart ideas held by Citibank Indonesia and the Indonesian Hope Foundation. In 2013, he was awarded a PhD scholarship from the Islamic Development Bank (IDB), Jeddah, Saudi Arabia, through an IDB-UNNES PhD fellowship programme. In the same year, he started his PhD study at the Institute for Mathematics and Computer Science Education, J.W.v. Goethe-Universität Frankfurt am Main, Germany, under the supervision of Prof. Dr. Matthias Ludwig from Goethe- Universität Frankfurt and Prof. Marc Schaefer, PhD from Rhodes University, South Africa. His PhD research focused on the MathCityMap project for Indonesia. In 2017 he was awarded a doctoral degree in Natural Sciences (Dr.rer.nat.) in the spe- ciality of Didactics of Mathematics after he furnished evidence of his ability in regularly conducted doctoral proceedings through his dissertation. 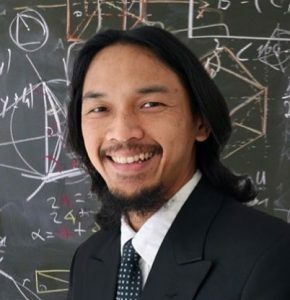 In the same year, he resumed his position as a lecturer at Universitas Negeri Semarang to teach in the undergraduate and postgraduate programmes of mathematics education. In 2019, he becomes an Expert Staff of the UNNES Chancellor for Academic Affairs. Dr.rer.nat. Adi Nur Cahyono, M.Pd. Lecturer in Mathematics Education/ Expert Staff of the UNNES Chancellor for Academic Affairs. Universitas Negeri Semarang (UNNES), Indonesia. Office: Gedung D7 Lantai 1 Kampus UNNES Sekaran, Gunungpati, Semarang 50229, Indonesia. (2000-2004) Bachelor Degree in Mathematics Education – Universitas Negeri Semarang (UNNES), Indonesia (Title: S.Pd.). (2005-2007) Master Degre in Mathematics Education – Universitas Negeri Semarang (UNNES), Indonesia (Title: M.Pd.). (2013-2017) Doctoral Degree in Didactics of Mathematics – J.W.v. Goethe Universität Frankfurt, Germany (Title: Dr.rer.nat.). A.N. Cahyono. (2017). Learning mathematics in a mobile app-supported math trail environment. Doctoral Dissertation, J.W.v. Goethe Universität Frankfurt, Germany. Advisor 1: Professor Matthias Ludwig. Advisor 2: Professor Marc Schaefer. A.N. Cahyono. (2007). Pengembangan model creative problem solving berbasis teknologi dalam pembelajaran matematika di SMA. Master Thesis, Universitas Negeri Semarang, Indonesia. Advisor 1: Professor YL Sukestiyarno. Advisor 2: Dr. M. Asikin. A.N. Cahyono. (2004). VCD dan Lembar Kegiatan Siswa untuk pembelajaran matematika di Sekolah Dasar. Bachelor Thesis, Universitas Negeri Semarang, Indonesia. Advisor 1: Professor YL Sukestiyarno. Advisor 2: Dr. Dwijanto. Expert Staff of the UNNES Chancellor for Academic Affairs (2019). Cahyono, A.N (2018). Learning Mathematics in a mobile app-supported math trail environment. Chem (Switzerland): Springer International Publishing. Cahyono, A.N., Suyitno, H. (2018). Pemodelan dalam Pembelajaran Matematika. Jakarta: BelmawaRistekdikti. Cahyono, A.N. (2018). Media Pembelajaran dalam Proses Perkuliahan. Semarang: LP3 UNNES. Asikin, M., Cahyono, A.N. (2017). Basic of Mathematics Learning Process 1. Semarang: Penerbit FMIPA UNNES. Cahyono, A.N. (2016). Sore di Tepian Sungai Main Frankfurt. In YL Sukestiyarno & MI Abdussalam (Editor). Pengembara Penjaga Lentera: Kisah Studi Dosen UNNES di Lima Benua. 47-60. Semarang: UNNES Press. Asikin, M., Junaedi, I., Cahyono, A.N. (2019). The INNOMATTS: A Model of Mathematics Teacher Training Management. Journal of Turkish Science Education. Vol.15, pp.76-86, doi: 10.12973/tused.10259a. Cahyono, A. N., Ludwig, M. (2019). Teaching and Learning Mathematics around the City Supported by the Use of Digital Technology. Eurasia Journal of Mathematics, Science and Technology Education, 15(1), em1654. https://doi.org/10.29333/ejmste/99514. Cahyono, A. N., Ludwig, M. (2018). Exploring mathematics outside the classroom with the help of GPS-enabled mobile phone application. J. Phys. : Conf. Ser.983 012152. Cahyono, A.N., Miftahuddin, M. (2018). Mobile technology in a mathematics trail program: how does it work? UJME. Vol. 7, No.1 pp. 24-30. Kharis, M., Cahyono, A.N. (2016). Pemodelan Matematika Pada EpidemiInfluenza Dengan Strategi Vaksinasi. JurnalMIPA.Vol. 38, No. 2. Asikin, M., Junaedi, I., Cahyono, A.N. (2015). Pengembangan Model Pelatihan Innomatts Untuk Meningkatkan Kompetensi Dan Karakter Guru Matematika. JurnalPenelitian Pendidikan. Vol.32, No. 2. Priambodo, A.S., Sugiarto, S., Cahyono, A.N. (2014). Keefektifan Model Learning Cycle Berbantuan Alat Peraga Terhadap Kemampuan Komunikasi Matematis. Unnes Journal of Mathematics Education.Vol. 3, No. 2. Khoiri, W., Rochmad, R., Cahyono, A.N. (2013). Problem based learning berbantuan multimedia dalam pembelajaran matematika untuk meningkatkan kemampuan berpikir kreatif. Unnes Journal of Mathematics Education.Vol. 2, No. 1. Cahyono, A. N. (2012). Virtual MATRiKS: a Conceptual Mathematization Process in Virtual Learning Environment. The Online Journal of Science and Technology.Vol. 2, Issue 3. Rasiman, Cahyono, A.N., Sulianto, J., Nurhadi (2008). Penelusuran lulusanprogram studi pendidikan matematikaIKIP PGRI Semarang melalui studi pelacakan (tracer study) sebagai umpan balik penyempurnaan kurikulum tahun2008. Media Penelitian Pendidikan.Vol. 2. Cahyono, A. N., Ludwig, M (2017). MathCityMap: Motivating students to engage in mathematics through a mobile app-supported math trail programme. Presented in Jahrestagung der Gesellschaft für Didaktik der Mathematik (GDM 2017), Potsdam (Germany), 27 February – 3 March 2017. Cahyono, A. N., Ludwig, M (2017). Examining motivation in mobile app-supported math trail environments. Presented in the 10th Congress of European Research in Mathematics Education (CERME 10), Dublin (Ireland), 1–5 February 2017. Cahyono, A. N., Ludwig, M (2016). MathCityMap: Exploring mathematics around the city. Presented in the 13th International Congress on Mathematics Education (ICME-13), Hamburg (Germany), 24–31 July 2016. Cahyono, A. N., Ludwig, M., Marée, S. (2015). Designing mathematical outdoor tasks for the implementation of the MathCityMap-Project in Indonesia. In Vistro-Yu, C. (Ed.). In pursuit of quality mathematics education for all: Proceedings of the 7th ICMI-East Asia Regional Conference on Mathematics Education, pp. 151-–158. Quezon City: Philippine Council of Mathematics Teacher Educators (MATHTED), Inc.
Cahyono, A. N., Ludwig, M. (2014). Designing of The MathCityMap-Project for Indonesia. In Oesterle, S., Nicol, C., Liljedahl, P., & Allan, D. (Eds.). Proceedings of the 38th Conference of the International Group for the Psychology of Mathematics Education and the 36th Conference of the North American Chapter of the Psychology of Mathematics Education.Vol. 6, p. 33. Vancouver, Canada: PME. Cahyono, A. N., Kharis, M. (2014). Mobile Social Media Application for Learning Calculus. In Chova, L.G., Martínez, A.L., & Torres, I.C. (Eds.). Proceedings of the 7th International Technology, Education, and Development Conference. Valencia (Spain): IATED. Cahyono, A. N. (2010). Vygotskian Perspective: Proses Scaffolding untukmencapaiZone of Proximal Development (ZPD) Peserta Didik dalamPembelajaran Matematika. Presented in the National Seminar on Mathematics and Mathematics Education, pp. 442–448. Jogjakarta (Indonesia): Department of Mathematics Education, UNY. Cahyono, A.N. (2009). Pengembangan model creative problem solving berbasis teknologi dalam pembelajaran matematika di SMA. Presented in the Fifth National Seminar on Mathematics, pp. 7–14. Semarang (Indonesia): Department of Mathematics FMIPA Unnes. Cahyono, A. N. (2009). E-learning, Tinjauan Konsep dan Implementasinya dalamPembelajaran Matematika. Presented in the National Seminar of Mathematics Education, pp. 192–209. Semarang (Indonesia): IAIN Walisongo Semarang. National Seminar on mathematics and mathematics education 2018 held by UPGRIS Semarang. Title: Integrasi teknologi dalam pendidikan matematika di era eksponensial: bagaimana konsep dan implementasinya? Semarang (Indonesia), 11 August 2018. Lecture series in the Johann Wolfgang von Goethe Universität Frankfurt, Germany. Title: Current issues on mathematics education in Indonesia. Frankfurt amMain (Germany), 28 July 2018. Lecture series in the Julius-Maximilian Universität Würzburg, Germany. Title: Current issues on mathematics education in Indonesia. Würzburg (Jerman), 29 July 2018. Technical Guidance for the implementation of PPG Hybrid Kemenristekdikti RI. Title: Hybrid learning for teacher professional program (PPG) 2018. Palu (Sulawesi, Indonesia), 2-3 June 2018. Studium General in the Department of Mathematics Education FKIP Universitas Pancasakti (UPS) Tegal. Title: Pembelajaran matematikadi era eksponensial. Tegal (Indonesia), 28 Juli 2018. Scientific Oration of FMIPA UNNES doctors. Title: Technology for and in Mathematics and Science Education during Exponential Era Semarang (Indonesia), 17 Maret 2018. Studium General in the Department of Mathematics Education Universitas Muria Kudus Peran Teknologi dalam pembelajaran matematikadiEra Digital Kudus (Indonesia), 13 Desember2017. Jahrestagung der Gesellschaft für Didaktik der Mathematik (GDM 2017). Title: MathCityMap: Motivating students to engage in mathematics through a mobile app-supported math trail programme Potsdam (Germany), 27 February – 3 March 2017. 10th Congress of European Research in Mathematics Education (CERME10). Title: Examining motivation in mobile app-supported math trail environments Dublin (Ireland), 1–5 February 2017. 13th International Congress on Mathematics Education (ICME-13). Title: MathCityMap: Exploring mathematics around the city Hamburg (Germany), 24–31 July 2016. The 7th ICMI-East Asia Regional Conference on Mathematics Education. Title: Designing mathematical outdoor tasks for the implementation of the MathCityMap-Project in Indonesia Cebu City (Philippines), 11-15 March 2015. The 38th Conference of the International Group for the Psychology of Mathematics Education and the 36th Conference of the North American Chapter of the Psychology of Mathematics Education PME38. Title: Designing of The MathCityMap-Project for Indonesia Vancouver (Canada), 14-18 June 2014. 7th International Technology, Education andDevelopment Conference (INTED2014). Mobile Social Media Application for Learning Calculus Valencia (Spain), 10-15 March 2014. UNNES Journal of Mathematics Education (ISSN 2252-6927) published by the Department of Mathematics UNNES, Indonesia. Eurasia Journal of Mathematics, Science and Technology Education (ISSN: 1305-8215) published by Modestum Ltd., UK. Indonesia in collaboration with SEAMEO Regional Centre for QITEP in Mathematics. Journal of Medives: Journal of Mathematics Education (ISSN: 2549-8231) published by the Department of Mathematics IKIP Veteran Semarang, Indonesia. Member of Fotografie Forum Frankfurt (FFF), Germany (2017 – 2018). Koordinator bidang Publikasi dan IT Pimpinan Cabang Istimewa Muhammadiyah (PCIM) Jerman Raya (Jerman, Austria, Belgia, Luxemburg, Switzerland, Poland, dan Liechtenstein). (2016-2017). Ketua Departmen B (Bidang Bakat dan Minat) Himpunan Mahasiswa Matematika (HIMATIKA) UNNES (2013-2014). Wakil Ketua II OSIS SMAN 1 Karangkobar, Banjarnegara (1999-2000). Content and Language Integrated Learning. Held by IALF (Indonesia Australia Language Foundation). 23-27 July 2018. Denpasar, Bali, Indonesia. Alpen Seminar: “Measuring in Geometry”, 15 seminar units, 3-8 August 2015. Penyelenggara: IDMI Goethe-Universität Frankfurt in The Alps, Riezlern, Kleinwalsertal, Austria. ESTMEE (European Student-Teacher doing Mathematics Education in Environment. Erasmus Intensive Program. 25 March – 5 April 2014. Bielefeld, Germany. “English Course”. Penyelenggara: Dikti Kemdikbud RI. Tempat: LBI FIB UI Salemba, Universitas Indonesia (February 20th, 2012 – August 20th, 2012). “Training of Trainer: Active Learning in Higher Education (ALIHE) held by Dikti Kemdikbud RI in Medan (2012). “The EdTech Leaders Online Programs Online Professional Development and Delivery”. Penyelenggara: Education Development Centre, Decentralized Basic Education (DBE) 2, US-AID ( June 1st, 2010 – July 31st, 2010). “Microsoft IT Training for ICT Teacher”. Penyelenggara: ProVisi Microsoft IT Academy Semarang (2006). Awarded a “PhD scholarship” (2013-2017) from the Islamic Development Bank (IDB), Jeddah, Saudi Arabia. “Teacher with Smart Idea” (2006) awarded by Citisuccess Fund Indonesia dan Yayasan Hope Indonesia. “Bronze Medal” (2003) in Pekan Olahraga Kabupaten Cabang Bola Basket Kabupaten Banjarnegara.